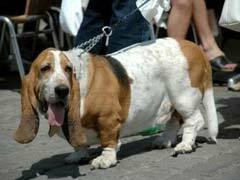 Large breeds of dogs are prone to hip dysplasia. German shepherd hip dysplasia is common. Hip dysplasia in dogs occurs when the leg bone does not fit properly in the hip socket. The ligaments become loose and can’t support the joint properly any more. Next, the cartilage, a tough but slippery substance, wears down so that bone rubs against bone. This is called osteoarthritis, a painful condition. You know your pet is experiencing dog joint pain if it is limping, refusing to play or engage in normal activities. In milder cases, dog hip dysplasia treatment might include liquid glucosamine for dogs. Glucosamine is one of the building blocks of cartilage. Non-steroidal anti-inflammatory medications can reduce pain and inflammation. A veterinarian may also prescribe corticosteroids as a dog hip dysplasia treatment. Supplements made from green bearded mussels, soy and avocado, and omega fatty acids are helpful as well. Make sure your dog is not overweight. Excess weight puts a strain on already painful joints. Make sure your dog’s sleeping area is nice and warm. A doggie sweater on cold days provides comfort. A bed made of orthopedic foam prevents painful pressure on joints and bones. Physical therapy and massage also ease your dog’s pain. If your dog has to negotiate stairs, consider a ramp to make things easier. You can also get elevated feeding dishes so that your dog can eat more comfortably. For severe cases, dog hip dysplasia treatment is more aggressive. Juvenile pubic symphysiodesis is a surgery that is done on dogs younger than 20 weeks. Two pelvic bones are fused together, which allows for normal development. Hip replacement is the dog hip dysplasia treatment for older dogs that have already developed osteoarthritis as a result of the dysplasia. There is no way to prevent hip dysplasia in dogs, however, careful breeding can reduce the chances of having dogs that will develop hip dysplasia.